Feel free to drop them in the comments here. I'm sticking to Crean to Bama with Indiana getting Marshall when Wichita St is done in the tourney. I believe IU will soften the buyout as they want to move on. If we strike out on Crean and Mi$$ $t gets Howland I might be upset. Unfortunately for DJC and myself it doesn't seem like Eustachy is getting a look. Maybe that changes if Plan A (Marshall/Crean/Smart) doesn't work. Early to bed early to... play a basketball game? I guess this was done to not interfere with NCAAT action. Since I didn't do a preview on Illinois and we won I'm going to do the same with Miami 'cause I'm a baseball fan and have superstitions. Gonna be a tough game... Miami won at Duke, beat our favorite ex HC Gottfried, but got blown out at home by one of the worst GA Tech teams I've seen in my lifetime. No... I didn't have Iowa State going far in my main bracket. I will admit, after losing to Florida in the SEC tournament, I really didn't want to go to the NIT. When I saw we were selected as the 6 seed Sunday night, my initial thought was, "I guess I should go to support the players/program," but honestly I viewed it more as a chore more than anything. Well, after watching that performance last night, I'm now all-in for this NIT run. If we make it to the finals, I will be in New York. Hell, if I didn't already have plans this weekend, I would seriously consider flying down to Miami. There are few things I find as exciting as a good coaching search. The renewed hope, the baseless rumors, tracking of airplanes, reading between the lines, the battles of the "sources," the different factions that develop within the power structure, we're all in for a stressful but exciting and entertaining next few weeks or so. I wanted to list some candidates and give my thoughts on all the names that I've seen mentioned here or elsewhere, but first I'd like to talk about some qualities that I believe are important for the new coach. First, it should go without saying, but I want someone who will represent the University in a first class manner. This was Coach Grant's strong suit, and this isn't about trading that for wins. We can win with class. Second, he needs to have a lot "up side." If we can't conceivably picture the guy taking us to a final four at some point, I don't want him. Familiarity with the region and experience recruiting the south are a plus, but I would also be open to a great recruiter with connections to a more fertile prospect base. Finally, I want someone who understands the importance of being an ambassador to the program and actively marketing it to the Tuscaloosa and Birmingham communities. I have been visibly absent from this blog almost all season long. Part of that has been due to work and family obligations and part due to illness. Most has been attributable to apathy. I was in favor of replacing Coach Grant last season but was determined to show up and support my team once the decision was made to keep him. Unfortunately the final results of the games became so predictable that I not only could not give away my season tickets but I did not even watch the games on television. I did not want to detract from the mood of the truly involved fans who contributed regularly to this site by complaining out of ignorance. I want to thank the Bama Basketball faithful who contacted A.D. Bill Battle to let him know your thoughts when the rumors surfaced last week that Coach Grant would be kept. There are not many of us. I was worried that your concerns would be ignored. My apathy bred ignorance persuaded me to keep silent. I could not express any opinion based on facts. I had not been observing the team's performance. My ill informed feelings could not have contributed anything meaningful to the conversation. The moderators here know my long time devotion to Bama Basketball. I fell in love with it as a student and have returned for several games almost every year since graduating. I've been a season ticket holder for the past ten or twelve years (maybe longer) and drive round trip from Mobile to as many games as I can, often staying up well into the night to post my observations before dragging my tired, old body to bed. I think I attended three games this past season and barely contributed to the blog. I have no idea whom the new coach will or should be, but I do intend to support him and our team. I will renew my season tickets. (I was going to abandon these very good seats if Grant was retained and probably would never have bought season tickets again.) I will attend as many games as I can next year and will add my vocal support to the team on the court in my customary, pro-active fashion. I would urge as many of the rest of you who can to do the same. 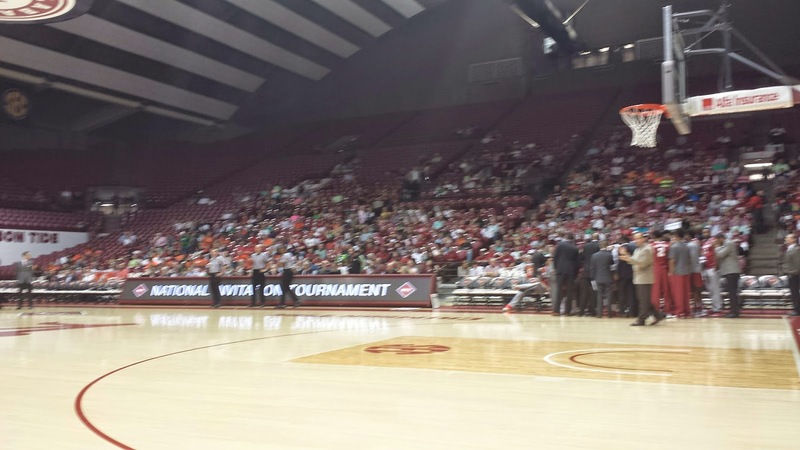 The Bama Basketball fan base is small but very passionate. The Tuscaloosa and Birmingham crowds are never going to support our basketball program the way they do our football program, but if we produce a winner then the crowds will return. I urge each of you who reads and contributes regularly at this site to show up early and often to create positive energy for our team and to show the curious how true, knowledgeable basketball fans can make a major contribution to their team's success, especially at home. The University has honored our request that they make a change. Let's honor their decision by trying to make Coleman Coliseum one of the toughest places in the country for visiting teams to steal a victory. Grant's Gone. End of Season/State of the Program Manifesto. WARNING: As you all know, I can be a bit verbose at times. This is one of those times. Sit back, relax, and get comfortable, because this is going to be a long read. Long time readers know that I like to sort of summarize the season and the current state of the program after we play our last game every year. I did not do this at the end of last season, because 1)Bobbyjack beat me to the punch and I would have been mostly echoing his thoughts and 2) I did not want to comment on the controversy surrounding Coach Anthony Grant. At that time, I told the other writers here privately that I personally thought we should make a change (especially after Buzz Williams left Marquette for Va. Tech, I felt we missed a great opportunity), but at the same time I could see some merit in the decision to retain Coach Grant. To post that I fully agreed with the decision would have been insincere. To write that I wanted a change in leadership, in my view, could have been harmful to the program at that time. I'm far from the best contributor to this blog, but two things I will never do is jeopardize my credibility or intentionally harm the program. As you all know, Coach Grant was relieved of his duties as head coach today. It was the right decision, and I believe the best solution for all parties. I'm never one to engage in letter writing campaigns, but even I made an exception and wrote an email to Bill Battle politely expressing the need to make a change. Coach Grant had completely lost the fan base, and it would have been impossible for him to turn things around in this current environment. He's represented the school with class, his teams played hard for him and never quit (which is a lot more than we can say for his predecessor), and I think he deserves another chance somewhere. I will be pulling for him, wherever he lands. As I said above, I wanted a change, but a part of me is sad to see him go. Like most fans, I really wanted him to be successful here, and was hoping he would be our coach for decades and take us to final fours and national championships. Obviously, that wasn't going to happen. Today is a sad day, but a necessary day. I have to admit, I'm surprised the team was selected for the NIT in the wake of the news today regarding the firing of Anthony Grant. Should be an emotional game for the players. Alabama will host this game because of a facility conflict at Illinois. For those of you who can make it, get out to the game and support these players. Please. Edit: We've had our disagreements here about Anthony Grant's worth as a head coach, but I think most of us agree he handled himself with class while at Alabama. Why the university couldn't extend the same class to him and wait until after the NIT announcement to make the change boggles my mind. I'm okay with them making a change regardless of what this team would do in the NIT, but at least let Grant finish the season. His players fought for him all season. He deserved the right to coach out the season. Another black eye for an administration that has looked extremely incompetent in recent months. I listed my top 5 in other posts, but interested in hearing yours. Be realistic please or I will mock you. BREAKING: The University of Alabama has fired head coach Anthony Grant, per The Tuscaloosa News' sources. Details at http://t.co/Tgm2OF9YMY. If this tweet is accurate, it appears that Anthony Grant has been fired. As I have been the chief defender of the faith in Anthony Grant at this blog for the last six years, I feel I am uniquely qualified to write this post. I have been called many unpleasant things the last six seasons as I have defended Anthony Grant from the wails and moans of the worst of the message board sect. In recent weeks, I have been forced to eat humble pie. It's not the first time I've been on the wrong end of a crusade, and it likely won't be the last. While my optimism about Alabama basketball has suggested that I am overly warm and fuzzy regarding all topics, the reality is that I am an overly hardened cynic, rendered wary and weary by a world in which the worst of our species thrive, while the best of us die. From a college basketball standpoint, we're seeing that point driven home this weekend as Bruce Pearl mugs for the SEC Network cameras, and has his team two wins away from an unthinkable SEC tournament title. Meanwhile Anthony Grant (whom, by all accounts, is a good human being that has run the Alabama program with class and humility) waits for a Sunday announcement of the NIT field, and/or possibly a pink slip for his termination. And as much as I hate to write this, that pink slip is painfully necessary at this point. Following the program's 11th straight loss to a Florida program whose 14-15 edition will finish the season under .500, and a record of 0-10 for Anthony Grant against that Gator program, the Alabama program as a whole is spinning its wheels in a mud hole of mediocrity. I've said for many years that the Alabama basketball program is a sleeping giant, but over the course of the last two seasons we've watched it fall into a coma. Attendance is down, apathy is high. And some tough decisions must now be made. Unlike some who read and comment to this blog, I have nothing but respect for Anthony Grant. You will never see me write that Anthony Grant is "incompetent" or one of the other numerous insults that have been directed towards him by some of our more, ahem, "passionate" readers. How or why would anyone of sound mind be disrespectful towards Anthony Grant? As noted above, he has been a class act during his tenure as men's basketball coach, representing the best aspects of a person as he trudges along in a tough profession that has taken many great men and women before him and reduced them to base animals, selling their souls for one more donation or win. In that respect coaches are not so different than politicians. If you're going to succeed in politics, coaching or any profession really, you are forced to play a game, the rules of which are not always yours to make. Anthony Grant has not always played by those rules, and it has cost him brownie points among the media, in high school recruiting circles, and, particularly, with the proles in the fanbase who, like most voters, only like the guy who sounds and looks the best on television. However, to be fair, it also comes down to wins. And the fact is that Anthony Grant simply hasn't won enough of the most important games during his tenure to build the momentum necessary to create a championship program. Yes, there are other obstacles that exist for a basketball coach at the university, but as Anthony Grant has been fond of saying over the years, the game is always the same within the lines; and the bitter pill to swallow is that his teams just haven't got it done between those lines. This is not to suggest that Anthony Grant is a bad coach. Some of you will disagree, but I don't buy the man is a bad coach. Put Grant on another bench at a different school, the results could be far different. And I believe the final word on his competence as a head coach should be determined at any future stops he makes. I feel confident that, should the university relieve him of his duties, he will land on his feet somewhere, and perhaps be the better for it. Grant's teams have always been competitive during his tenure, but they have just never been able to get over the hump in key games. The Wichita State game in December was a great example of the struggles under Grant. His team, on the road in one of the most hostile environments in the college game, outplayed a top twenty RPI team for thirty-five minutes, but when it came to winning time, the team faltered under the pressure that comes with winning, as we've seen them do too many times in the past. A key aspect in coaching is the ability to motivate and convey mental toughness before, during and after a game. While Grant's teams have always been resilient overall, they have always seemed to lack resiliency in key situations in games. In the Wichita State game, it was simply a matter of protecting the basketball for five minutes of game time. Turnovers had been minimal for the first thirty-five minutes, but the team fell apart in the final five. That goes back to the bench, right or wrong. Yes, players have to make plays, but a coaching staff has to be able to imbue them with the confidence that they cannot be denied, regardless of the opposing team. How does a program, in this day and age of the sport, lose to the same program eleven times in a row? Despite Florida's success, they have not been light years ahead of Alabama in terms of talent. And yet, Alabama has been unable to win one game in the last eleven meetings. Bruce Pearl, for all of his perceived faults, understands the importance, as the coach of Auburn, in beating Alabama, just as he understood the importance of winning at least one game in Nashville this week. The wins over A&M, LSU and beyond will be cherries on top. It was the Wednesday game against Mississippi State that was the most important game. And Auburn won the game. I can assure you that every future team under Pearl will have that importance of certain games hammered home. One wonders if that same level of importance was leveled at Florida by Anthony Grant at any time prior to one of the ten losses that have occurred under his leadership. I can't believe it was, for if it had, I feel confident that Alabama would have, at the very least, a handful of wins against that program. The time is now. The rumors continue to swirl about whether or not Grant will receive a seventh season, but after the last six seasons, I'm not sure that's the best thing for either party, UA or Grant. The university is going through many administrative changes. Within the next year alone the university will have a new president and, maybe, a new AD. The thought process may be to delay any coaching changes until that transition is completed. As I've said here before, if Grant is retained I will gladly pull for him, his staff and the team to finally find a way to get over the hump. However, I can no longer hold firm to the belief that glory days are ahead for this program under Anthony Grant's direction. And that realization creates a deep, lasting pain in my gut, for it tells my cynical mind that virtues alone is not enough. That we are seemingly cursed to always live in a world in which we must bite our lip, and concede that good will never be good enough. Damn. No wonder some people hate sports. 1) Eric Musselman- MS mentioned him below... would be FANTASTIC due to his NBA ties and his coaching history. From all accounts he's doing the leg work at LSU right now. 2) Dwayne Stephens- yeah... I think he'd help us bring in big men that can rebound. He's also young and probably would run with the program (promote the heck of out it). 3) Bacari Alexander- Might be the most underrated one on this list. He's the one that brought in the talent to Michigan. Beilein is holding on to him as long as he can. 4) Bobby Lutz- yeah... I think Mark Gottfried would tell him to wait for a better job, but he'd be a fool not to come here if offered. His success with UNC-Charlotte and being the glue behind NC State's 4 year run at the NCAAT makes for a solid hire. Age is an issue so he's down the list. 5) Steve Robinson- Roy Williams' top recruiter. He'd bring the talent in for sure. Previous experience being the HC at FSU and Tulsa helps... even though that was a long time ago. My only gripe is his age which puts him 5th on my list. We played well for the first ten minutes or so. We moved the ball, played good defense, and built a 9 point lead. Unfortunately, we got absolutely nothing from the bench. When we switched to a zone, Florida lit us up, and we couldn't get a rebound when they missed. Offensively, we slowed the game down and couldn't get any decent shots. It's bad enough that we got no points or rebounds from our bench, but we also went over 20 minutes without making a single jump shot from outside the paint. It seems like our hottest players always end up in foul trouble. Cooper had a great first half, but then had to come out of the game 4 minutes into the second half with four fouls. Riley Norris also played much of the game with 4 fouls. Despite the poor shooting and lack of help from the bench, the starters did a remarkable job of keeping us within shouting distance for most of the game. Levi was able to get to the line and go 11 of 11 while scoring 15. Jimmie had another great game with 15 points, Coop got 13 despite the foul trouble and Retin was solid with 10, while Riley made a couple of 3s and scored 8 points. There were 2 key plays in the second half that put us away. First, with around 10 minutes remaining, we had cut the lead to 3 but then had an awful offensive possession where we couldn't get a shot off. Florida made a 3 at the other end, we turned it over, and the Gators drained another 3, so within a minute their lead was back to 9 after we had spent the last 3 or 4 minutes chipping away to get it back to within one possession. We had one more run in us, and were down 7 with 3 minutes to play when Coop scored and should have got the "and 1" on a blocking foul. The free throw could have cut the lead to 4. Instead, the official called Coop for a charge, which was also his 5th foul. Predictably, Florida nailed another 3 at the other end, and the lead was back to double-digits. It was horrendous call, and I would have liked to have seen Coach Grant argue it a little more adamantly, especially once it became obvious that it cost us any chance of winning the game. With the loss, our championship aspirations are finally, officially extinguished. Up next, selection Sunday. The NIT Selection show will air Sunday at 7:30 pm on ESPNU. Most bracketoligist had us in the 3 to 5 seed range before today. Take 2 of our epic one sided rivalry with Billy the Kid and his Florida Gators. This game is for jockeying of NIT seeding for us so it's extremely important. Or not. Kentucky in a surprisingly close one over Vandy. Let me state that I DO NOT THINK GRANT WILL BE FIRED AT THE END OF THE SEASON so this is purely an exercise in futility... but I'm going to do it anyways. 1) Gregg Marshall- The FIRST call. What he has done at Winthrop and Wichita State is impressive. Yeah, he has the mid- major stigma, but unlike all of the others I think he's a special coach that can win ANYWHERE. I've got a stiff drink, the Vandy/Ole Miss game on the telescreen, and Johnny Cash on the stereo. Let's do a mother(watch your mouth) recap. With the realization (of course) that I can't do justice to the fantastic recaps that DJC provides this blog every season. You remain the gold standard, DJC. Since leaving the great state of Alabama over a decade ago, my ability to attend games has decreased. Therefore, when I can get back home for a game or catch a game in my reasonable vicinity, it's always exciting, despite what the win/loss record is for the team I love.Even better when my team gets a win. I'm not an expert when it comes to grading arenas so I won't grade Reed Arena. Hopefully, DJC won't oversleep next time and miss his chance to visit the flat and uninspiring chunk of Earth that makes up College Station. At that time, he will give a fair but honest review of Reed Arena. I can say that I was fortunate enough to be seated next to some gracious Aggies who were engaging before, during and after the game. I think all of us have attended road games in the past in which we have been confronted with less than friendly fans. I did not experience that today, despite the A&M team suffering a tough loss that could impact their NCAA tournament hopes a week from now. With that in mind, one thing that should be noted is that A&M was without Danuel House, their top player, who suffered a foot injury in their loss at Florida earlier this week. House averages just under 15 points a game, and the team really missed his scoring in the second half when Alabama went on a 24-06 run in the first nine minutes of the half. Hopefully, the selection committee will consider House's absence if/when A&M comes under the microscope on Selection Sunday. I had to watch this one on TV, as I apparently slept through my alarm this morning. Despite setting my alarm for 5 a.m., I woke up at 7, long after my 6:20 am flight to Houston had departed. As such, I missed probably our best win and most entertaining game of the season, such is life. Hopefully MSmilie will give us a first hand report. During the first half I was beginning to think my misfortune was a blessing in disguise. We played yet another horrendous first half of basketball. We had no movement or spacing on offense, too many turnovers, and stubbornly stuck to a zone defense despite an obvious inability to rebound out of it. We trailed by 14, and appeared to be in danger of being run out of the gym. I know this season has been a disappointment, but you have to love how these guys never quit. We looked like a completely different team in the second half. We actually moved the ball crisply on offense and attacked the basket, getting the Aggies into foul trouble early in the second half. This opened up a lot of options for us. Meanwhile Jimmie Taylor was a beast defensively. The Aggies insisted on trying to work the ball inside, and Jimmie would not let them get a decent shot off. More importantly, they were one and done on every trip. We were able to turn that 14 point halftime deficit into a 4 point lead. The 8 to 5 minute mark was as exciting as you will see in college basketball, with both team exchanging 3s and the lead in a close game. With the exception of Riley Norris, all of our starters scored in double digits, and Dakota Slaughter had another nice game off the bench making a couple of huge 3s and contributing with 8 points. Retin, Coop, Levi, and Jimmie all stepped up big time in the second half. The team showed a lot of heart in not throwing in the towel when down big early, but more importantly fighting back every time the Aggies retook the lead, and ultimately making the defensive stops at the end of the game in a hostile environment. With the win, we finish the regular season with an 18-13 record, 8-10 in the SEC. I haven't looked at all the tiebreaker scenarios to be certain, but I believe this puts us in 8th or 9th place. I guess this probably puts us in good position to make the NIT, for whatever that is worth. Up Next, the SEC tournament! It's a new season. One of the things I love about college basketball is the "second chance" aspect of March. Even the worst teams out there, theoretically and mathematically at least still have a chance to win it all. I'll update this when the bracket is finalized, but more than likely we will be playing either Vandy or Florida at noon Thursday in Nashville. Unfortunately, this means if we win, we would have a date with undefeated Kentucky Friday. I hope DJC and MSmilie get there early enough to receive a 12th MAN TOWEL and a chance to shoot for $5000 at halftime. While this isn't as good as Star Wars night, it's a good promotion. Anyways... to the game at hand. I missed the first 5 minutes of the game because I had to take care of a work call before entering the gym. I understand we jumped out to an 8-0 lead, and we were still up 15-9 when I made my way down to my seat. Maybe I should have just stayed in the car. Unfortunately, the trend of only playing one good half continued. We lost momentum in the closing minutes of the first half when we bricked some free throws, turned the ball over, and gave up a 3 pointer at the buzzer cutting our lead in half at 30-27. In the second half, once Jimmie Taylor went out of the game with 3 fouls Ole Miss went on a 17-3 run (before we called a timeout, I might add) to take a 9 point lead. The key series of events came with around 9 minutes left, and Ole Miss leading by 3. The Rebels missed a 3, but Kessens failed to block out and Ole Miss got the rebound, making good on their next 3 point attempt. In fairness, Jimmie Taylor was at the scorer's table waiting to check in at that point. Rather than calling a timeout, Cooper turned the ball over leading to another wide open 3, giving the Rebels a 9 point lead. We finally called the timeout, but the lead was too much to overcome. With Jimmie on the bench, Ole Miss did not have to respect our inside game so they really extended their defense and put a lot of pressure on our guards. We had too many turnovers and otherwise could not get anything going offensively for much of the second half. The turnovers, and inability to slow down the Rebels point guard play, led to an abysmal second half defensive performance. During the timeout, Coach Brannen really chewed Mike Kessens, but Mike's body language was not very receptive or respectful. With our recent second half struggles, I have to wonder if the lack of depth is becoming an issue. We're only going 8 deep, including playing Dakota Slaughter for 21 minutes in this game. Dakota had a very nice game, scoring 8 points and going 2 for 4 from 3 point range, and he held his own defensively. Perhaps he should have been receiving a little more playing time all along, I think he's at least good enough to give us some quality minutes while the scholarship guys get a breather. I also don't understand why we haven't seen Devin Mitchell the last few games. Especially as much as we were pressing once we fell behind in the second half, it would have been nice to have some more warm bodies out there. I have to give credit to Ole Miss's Stefan Moody. I really like the way he plays the game. He's a lot like Retin athletically only quicker, but he has outstanding vision and makes great decisions. He scored 25 points, and his dribble-drive and passing ability directly led to many more. It's unfortunate this senior class had to go out with a loss, as they have stuck with us and continued to work hard through good and bad times the last 4 years. Levi certainly did everything he could as captain, 32 points, 39 minutes, and a school record 17 for 17 from the line. Coop also finished strong with 14 points and 6 of 7 from the line, and as discussed above Dakota Slaughter played well, and probably could have got even more minutes if not for having to come out of the game with a bloody nose. It's sad that we may never get to watch those 3 play in Coleman again, and I certainly wish them the best in the future. It was a small crowd of only around 4,000, but many people moved down closer to the court and those who showed up were generally loud and supportive, trying to will the team back from behind in the final minutes. If you thought we would be a bubble team this year, congratulations, you were right. We are squarely on the NIT bubble. The loss was a huge blow to any realistic chances we had of making a run in the SEC tournament. With Florida's win over Texas A&M, we are now mathematically eliminated from 7th place. We will more than likely have to face either Florida or Vanderbilt in the Thursday game, and we all know what little success we've had against either of those teams. If you are still holding out hope, the best case scenario for us is Tennessee somehow upset LSU in Baton Rouge tonight then beat South Carolina while we lose our final game to drop down to the 10 seed and avoid a potential second round matchup with Kentucky. Up next, we go to College Station, TX to take on the Texas A&M Aggies in a 1 pm tipoff that will be televised on FSN. As I said above, a loss could be better for our SEC tournament projections, but a win is likely needed for NIT hopes, for whatever that is worth. I am making the trip, which will complete my tour of the SEC arenas. I'm looking forward to meeting MSmilie at the game. The Black Bear Rebels come into Tuscaloosa looking for their 20th win of the season and to improve their NCAAT status (only an epic collapse would leave them on the outside looking in). Meanwhile, we are looking to rebound from an AUful 2nd half in Nashville and creep one step closer to .500 in conference play.